Well spring is cruising right along and I am definitely enjoying the fresh produce, the weather and the springtime social events. Wherever you are, you’re either enjoying spring or fall offerings at your local market, and probably have a few favorites that you just love to see come into season. For us the lettuces, blueberries, Persian cucumbers, and early stone fruits are captivating our taste buds. I hope wherever you, are you are enjoying life and the Wonderful raw offerings nature has provided for us. 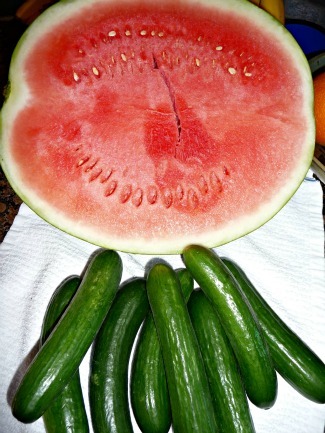 It doesn’t get any better than healthy raw foods shared with loving family and friends. 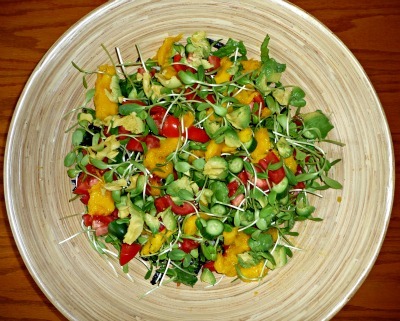 In this edition of Vibrant Living I share another new webpage and a host of new raw recipes. A series of health stats, quotes, and a short article on something I think we all take for granted when discussing GMO’s. There is another new page on the website that I think you will enjoy. If you’ve not yet had a chance to check it out then please take a look and send me your feedback. Last Saturday Gretchen and I supported the local environmental action committee from Branson High School with their March on Monsanto Demonstration in the town that borders our own. We had a fairly small (approx. 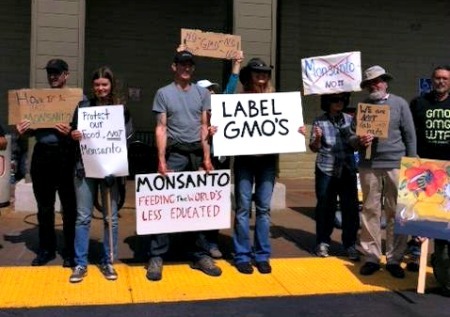 24 people) but very enthusiast group that led an effective campaign to educate people about GMO’s and Monsanto. We live in an overall well educated and a left of center county in northern California where many of the most progressive ideas and beliefs are fostered, but I must say I was astonished by the level of ignorance about the GMO topic. One woman at the Safeway store where our march started was giving us the “thumbs up” while she wheeled a shopping cart full of GMO products to her car. I think we often assume people “know” this or “understand” that, when in reality they are busy with their lives and get most of the news through sound bites and headlines or other uniformed people. Most people are overwhelmed with all the causes that drop in their “inbox” and basically tune out and just try to live their busy lives. And on some level I relate and understand, but unfortunately this is the same uninformed group who votes. Last year proposition 37, the initiative to require mandatory labeling of GMO foods was on the California ballot. Monsanto threw millions of dollars into that initiative fight to misinform that they are safe, and to scare the voters with the idea that it would raise the cost of food to label, and those two lies caused the defeat of that proposition. I think probably most of you reading this article understand the dangers of GMO’s and support at the very least their labeling, and hopefully their retraction from the marketplace, fields, and laboratories completely. I’m writing today because I think perhaps you may have been like me just assuming everyone “knows”, when in truth there are many among us that are not fully informed to the point they will not waiver in the face of a deceptive ad campaign. Please keep an eye open for any opportunity to share truths about Monsanto and GMO’s with friends, neighbors, acquaintances, and complete strangers. The only hope we have of succeeding is in this grass roots method of educating and planting seeds of our own. If you yourself need more information or talking points a quick internet search will provide you with plenty of fodder. And by the way, we did receive a great deal of positive appreciation as people honked, waved and called out their support, and hopefully we got to expose a few new people to this important issue. A Series of Health Statistics that show the need for a proactive stance in terms of our health and healing. 1) The 1992 Bogalusa Heart Study confirmed the existence of fatty plaques and streaks (the beginning of atherosclerosis) in most children and teenagers. 2) When subjects eating foods low in caloric density, such as fruits and vegetables, were compared with those consuming foods richer in calories, those meal plans with higher calorie concentrations were found to consume twice as many calories per day in order to satisfy their hunger. Physiol Behav. 2009 Jul 14;97 (5):609-15: Rolls B.J. 3) Out of 300 umbilical cords from newborn babies tested by John Hopkins Hospital in Baltimore, 298 of the contained a suspected carcinogenic chemical used to make Teflon, the coating on nonstick cookware. 5) The World Health Organization (WHO) estimates that 1.6 billion adults on the planet are overweight and 400 million are obese (2006). By 2015, WHO predicts that 2.3 billion people will be overweight and 700 million obese. 6) It is estimated that one-third of married couples today suffer fertility problems. 7) Two decades ago, autism afflicted just 1 in every 2,000 school children. Today autism has been reported in 1 out of every 175 children. 8) In a twenty year study of over eighty-two thousand woman in the USA, the risk of heart disease was 30 percent lower in participants who got their protein and fat from vegetables rather than from meat. 9) In a European study called EPIC involving half a million people, diet was found to be second only to smoking as a cause of cancer. Obesity was found to contribute to breast, womb, kidney, and bowel cancers, while the consumption of red meat and preserved meat was found to increase the risk of a variety of cancers. 10) A large scale study of patients with incurable lung cancer who were given just weeks to live found that unconventional treatments such as a diet of raw vegetables sometimes prolonged their lives or resulted in complete recovery when radiation and chemotherapy had failed to help them.